Born on January 6, 1970, in Quebec City, Canada, and raised in Saint-Lambert near Montreal, Canada. He is married and has three children. He is a lifelong mountaineer, cyclist, skier and avid sailor. He also holds a commercial pilot licence with multi-engine and instrument ratings and an advanced scuba-diving licence. Saint-Jacques is fluent in English and French and can also converse in Russian, Spanish and Japanese. Saint-Jacques earned a bachelor of engineering in engineering physics from École polytechnique de Montréal, Canada (1993). He earned a Ph.D. in astrophysics from Cambridge University, UK (1998). He earned his M.D. from Université Laval in Quebec City, Canada (2005), and completed his family medicine residency at McGill University in Montreal, Canada (2007), where his training focused on first-line, isolated medical practice. Prior to joining the Canadian Space Program, Saint-Jacques was a medical doctor and the Co-chief of Medicine at Inuulitsivik Health Centre in Puvirnituq, Nunavik, an Inuit community on Hudson Bay. He is an Adjunct Professor of Family Medicine at McGill University and also worked as a Clinical Faculty Lecturer for the university’s Faculty of Medicine, supervising medical trainees in Nunavik. Saint-Jacques began his career as a biomedical engineer, working on the design of radiological equipment for angiography at Lariboisière Hospital in Paris, France. During his graduate studies in astrophysics he developed adaptive optics and interferometry systems for the Cambridge Optical Aperture Synthesis Telescope and the William Hershel Telescope in the Canary Islands. His postdoctoral research included the development of the Mitaka infrared interferometer array in Japan and the Subaru telescope adaptive optics system in Hawaii (1999 to 2001), after which he joined the Astrophysics group at Université de Montréal. His international experience also includes engineering study and work in France and Hungary and medical training in Lebanon and Guatemala. Saint-Jacques was selected in May 2009 by the Canadian Space Agency (CSA) and moved to Houston to be one of 14 members of the 20th NASA astronaut class. 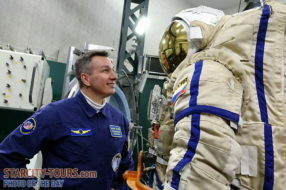 In 2011, he graduated from Astronaut Candidate Training, which included International Space Station (ISS) systems and procedures, spacewalks, robotics, T38-N flight training, field geology training, Russian language, and wilderness summer, winter and water survival training. Since graduation, he has been continuously training to maintain his skills as well as taking part in various geology, glaciology, speleology and other scientific expeditions such as the underwater NEEMO 15 mission and the underground CAVES 2013 mission. Saint-Jacques supports the space program through his work with NASA and the CSA, and routinely shares his passion for science, technology, engineering and mathematics (STEM) with young Canadians. After completion of basic training, he was first assigned to the Robotics Branch of the NASA Astronaut Office, then successively acted as Support Astronaut for ISS Expedition 35/36; Lead Capsule Communicator (or Capcom, the Mission Control space-to-ground radio operator) for ISS Expedition 38; Deputy Capcom for Cygnus-1 and Cygnus-2 ISS resupply missions; and Lead Capcom for the Cygnus-3, Cygnus-4 and SpaceX-6 ISS resupply missions. He recently acted as a Capcom instructor and supported the Visiting Vehicle Operations in the ISS Integration Branch. In May 2016, the Honourable Navdeep Bains, Minister of Innovation, Science and Economic Development and Minister responsible for the Canadian Space Agency, announced that Canadian astronaut David Saint-Jacques has been assigned to Expedition 58/59. Since August 2016, David has been training in Canada, Russia, the United States, Europe and Japan, where he is honing his skills and knowledge on the International Space Station, the Soyuz spacecraft, and a variety of mission-specific tasks. Canada Scholarship (1989 to 1993).